My son started 8th grade this week. He had one day of school and now him and his class are off on a 10 day camping trip. It’s amazing how quiet a house can become once it’s vacated of one’s child. It makes me realize how much of my life revolves around my son. Getting up early to get him ready and driving to school, driving to tutoring, driving to practice, not to mention the constant care and feeding of a growing teenage boy is practically a full-time job in itself. Since I have a week to myself I’m going to do some of the things that I don’t normally make time for. I have a haircut scheduled, a massage and more importantly I’m going to try my hand at some home improvement projects. Let me start by stating that I am not handy and have always avoiding any do-it-myself tasks around the house. I tend to have great ambitions but poor follow through so I’m hoping I can keep it together and get it done. There is a certain pride that comes from doing something yourself. As long as I don’t end up in the emergency room I’ll be calling it a success. 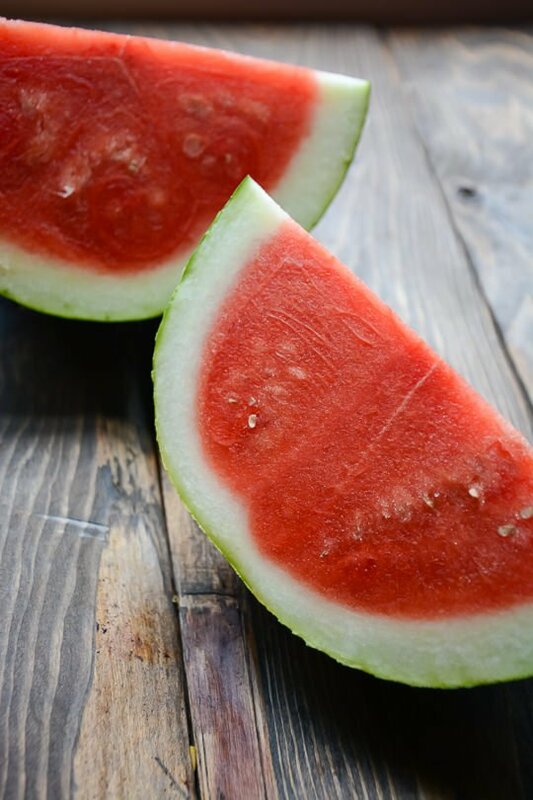 Along with no school lunches to prepare I get to focus a bit more on what I want to eat and one of my favorite things to eat during the late summer months is watermelon. 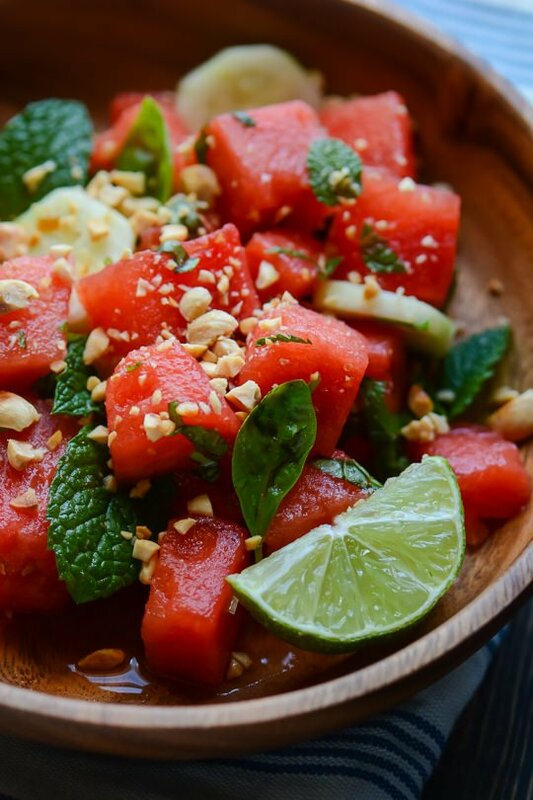 After managing to eat a four pound watermelon in about three days and I was still craving more so I wanted to see if I could make more of a meal out of it. I looked to my favorite Thai flavors, I wanted it to be a nice balance of salty, spicy and sweet and I was really pleased with the result. The addition of the spicy chili sauce really added a nice touch of heat and the lime and orange a nice touch of acid. If you don’t like spicy you could easily omit the chili sauce and it would still be delicious. I found it the perfect light lunch but if you are looking for something more substantial some cooked shrimp would make a nice addition. I hope you all enjoy the first week back in school as much as I will! 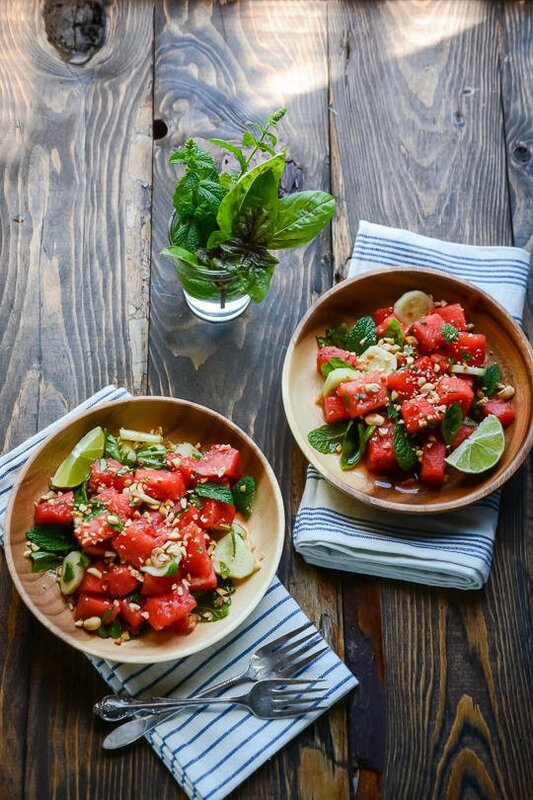 Fresh, bright and full of flavor, this salad is the perfect way to highlight fresh summer melon. In a large bowl, whisk the lime juice, orange juice, fish sauce, chili sauce and ginger. Season with salt and pepper. Add the watermelon, cucumber to the dressing. Fold in the mint and basil, season with salt and pepper to taste and sprinkle with the chopped peanuts. Oh boy, does that ever sound good. 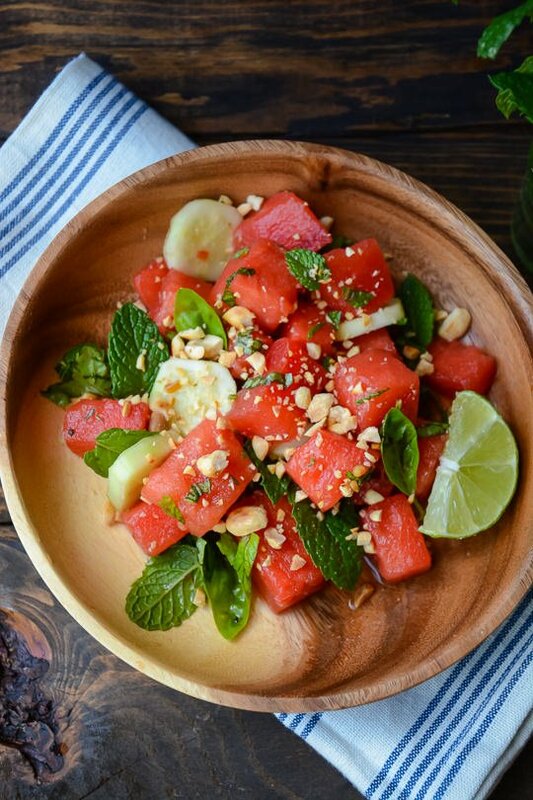 What a lovely savory take on watermelon salad. Love the spicy, sweet, salty combo here and the addition of nuts. Enjoy your quiet week! Wow, your photography is great! As is the presentation. Great job! Thank you so much for your recipe! Found you on Pinterest and can so relate! We started our downsizing 7 years ago! As the result of it we each lost 60pounds and got totally out of debt and feel so alive we just can’t stand it! For anyone wanting to do this I say jump it’s awesome so freeing! 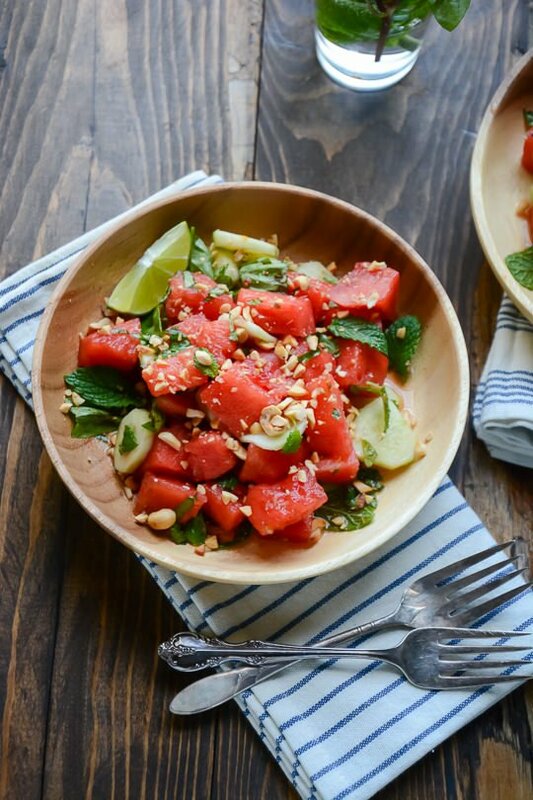 So on that I say I’m off to enjoy this beautiful watermelon salad! Yum! I love all the colors and textures in this dish. I just cut a large watermelon last night. May have to try this – Thanks for sharing! THANK YOU. 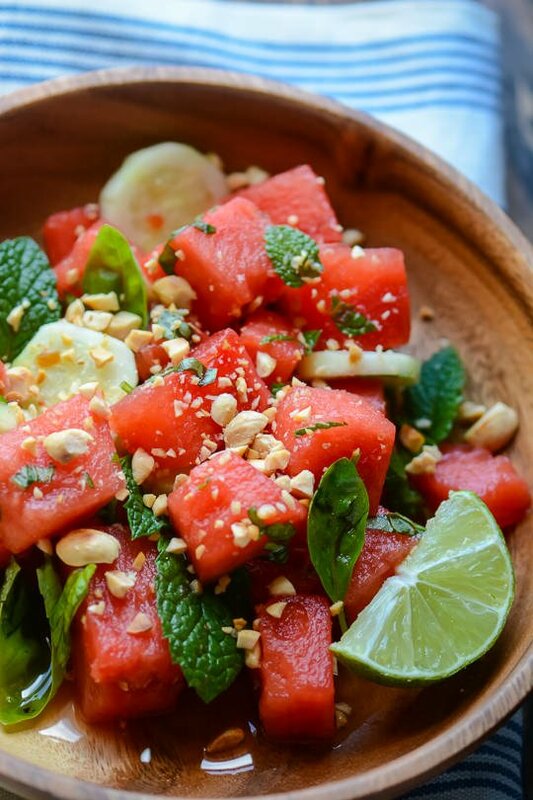 i CHOSE TO TRY 2 tHAI RECIPES WHICH LOOK TO HAVE INTERESTING INGREDIENTS, ESPECIALLY WATERMELON WHICH IS USUALLY SO REFRESHING. aLSO I LOVE THE FLAAVOR OF CARDAMOM, AND THE BUTTER SOUNDS GREAT–THANKS FOR TH SUGGESTION OF FRUIT DIP–MIGHT BE GREAT ON APPLES. WILL TRY TO RETURN A WORD ABOUT TASTE BUT I’M SELDOM ORGANIZED ENUF TO GET EVERY THING DONE. 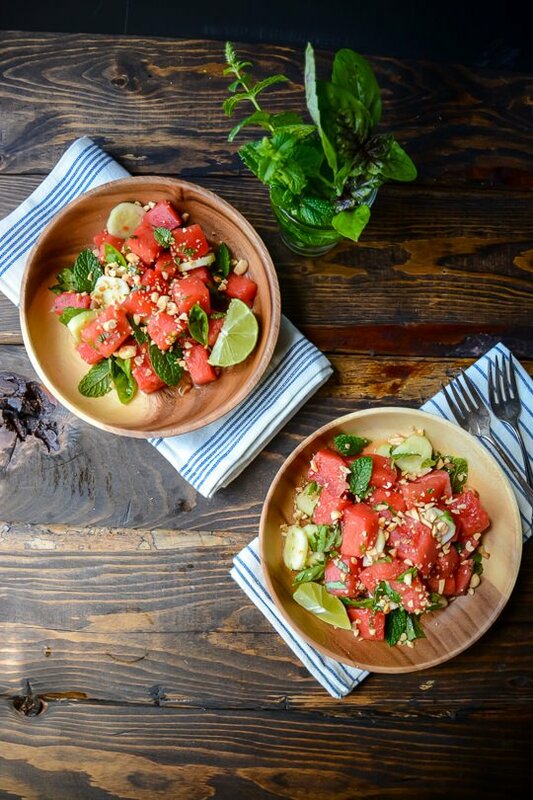 INOTICED YOUR RECIPES DUE TO OREGON (ON MY BUCKET LIST) AND THE WATERMELON SALAD’S CREATIVE AND COLORFUL APPEAL.